This news item was posted in Business, Technology category and has 0 Comments so far . Ever a brand of the people, Pakistan’s leading smartphone brand Infinix has always strived to provide its consumers with only the best of the best. 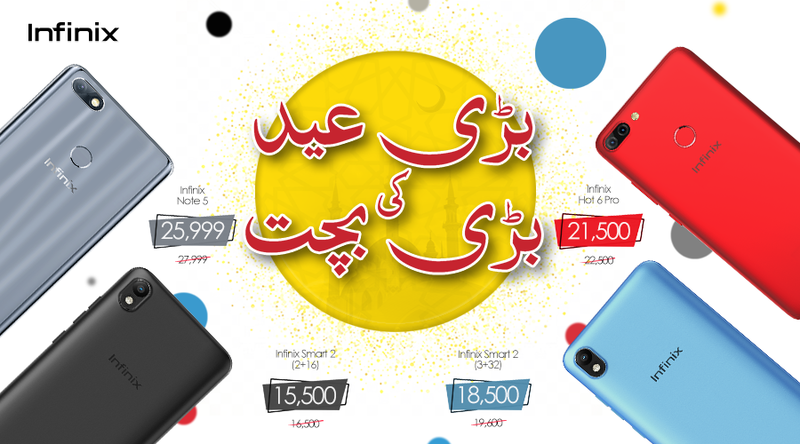 Already known for combining innovative, cutting edge technology with affordability, Infinix has gone one step further this Eid by offering amazing discounts on all its bestsellers to give consumers one more reason to celebrate. “Eid is a time for celebration and the giving of gifts. This is Infinix’s gift for its Pakistani consumers and through this we also hope to promote the spirit of gift-giving in others looking to make this Eid even more special for their loved ones”, said Infinix’s General Manager of Pakistan, Willy Cui. Effective from 16th August, the Infinix Note 5 (4 GB+ 64 GB) will be available for PKR 25,999. The Note 5 features a stunning 6.0 inch FHD+ Infinity display, a 16 MP Low Light Selfie front camera, a massive 4500 mAh battery, and integrated with Android One. The Infinix Smart 2 is also included in this offer and features a 5.5 inch Infinity HD display, 8 MP Dual Flash Low Light Selfie front camera, and highly intelligent Face Unlock. The Infinix Smart 2 (3 GB + 32 GB) will be available for PKR 18,500 and the Smart 2 (2 GB + 16 GB) for PKR 15,500. Last, but not the least, is the Infinix Hot 6 Pro (3 GB + 32 GB) with 6.0 inch Infinity display, Dual rear camera, 4000 mAh battery, accurate Face Unlock, and a powerful Qualcomm Snapdragon 425 processor. The Infinix Hot 6 Pro will now be available for PKR 21,500. Infinix has achieved its success through the careful consideration it gives to the needs of the local market and working to provide high-tech, state-of-the-art smartphones that meet all those needs. People can avail these offers from their nearest sales centers nationwide or online.